This video shows how to add our new Volume 2 libraries in Forest Pack format to your library browser. These libraries allow you to easily switch back an forth between V-Ray and Mental ray shaders. You can also see these steps written out with screenshots by viewing the Detailed Instructions. 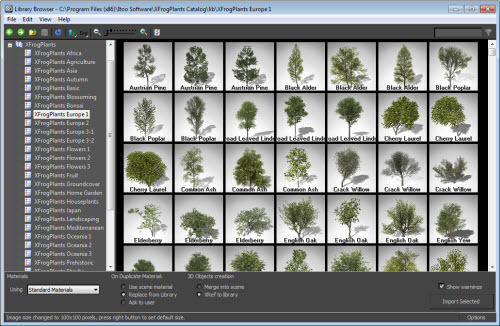 If you are using models from Volume 1, you will first need to download the Xfrog Catalog for ForestPack. XFrog Catalog does not configure the texture paths, this is responsibility of the user. Usually the texture paths must be added to the Max configuration, using Customize->Configure User Paths->External Files, but Xfrog uses a texture folder for each model, so the number of paths may be very high, when using multiple libraries. In this case we suggest to copy all textures in an unique folder, adding the folder to User Paths. To help you with this process, we have written a Max script that collects all textures with a single click. You can download the script here. Unzip the .ms file and launch it from MAXScript->Run Script. Select the source and destination folders, and click Collect to copy the files. When finished, add the destination path to the Max configuration (User Paths). Most XfrogPlants models are high-poly meshes with opacity maps to define leafs and details. These high-quality models could lead to increased render times if the scenes are not properly optimized. Forest Pack includes an optimization tool that will help you maintain a low render times while leveraging the full potential of XFrogPlant models. 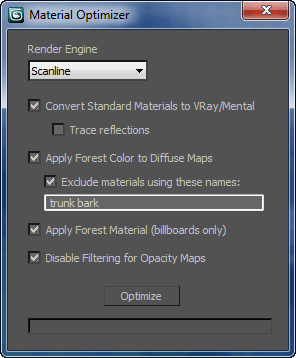 The Material Optimizer tool converts automatically the standard scanline materials, to native materials for the most common 3DSMax render engines. With this utility you can benefit of improved render times and realistic look only with a single click. To use it open the Materials rollup in your Forest object and press the Optimize Materials button. XFrogPlants for 3DSMax includes standard materials for Scanline renderer. To get the best results with Forest Pack, run the Material Optimizer once you import the XFrogPlants models in the scene. For Mental Ray the materials are converted to native Arch & Design. For VRaythe materials are converted to native VRayMaterial. During the conversion, the diffuse, opacity and bump maps, colors, and material look are preserved. Optionally Forest Color can be added to the diffuse channel.